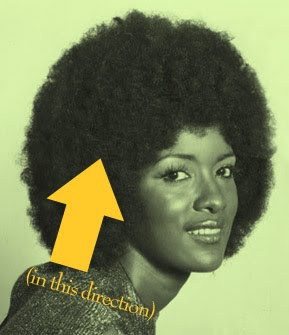 Back of the Cereal Box: “Moving in the Direction of the Bushy Hairstyle”? I tend to misread certain words. Infarction, for example, I often read as infraction until I realize that the sentence makes no sense. Who knows how many times a sentence may have made sense with either word and I just continued on, thinking that someone had broken a rule when they actually were suffering from hypertension or atherosclerosis. The word of the week works similarly, for me at least. I only recently learned of it, but, now that I consider the situation, my eyes could have easily passed over it and wrongly thought it was the much more common word it resembles. froward (FROH-werd or FROH-erd) — adjective: willfully contrary; not easily managed. As I type this, I notice that Word’s autocorrect function keeps changing my every mention of froward to forward, so even computers may not be immune to the confusion between these two words. But maybe this little post will remind us all that this word exists and is not necessarily a typo. Although froward can be explained as the opposite of toward — you know, as in to and fro? — toward isn’t often used in this sense anymore. In addition to the more common use of toward as a preposition (for literal directions, as in toward the house, or figurative ones, as in his attitude toward women), it can also mean “about to come,” “going on” (in the sense of There is work toward), “favorable,” or in obsolete senses, even “promising” or “compliant.” But while the definitions of toward that most apply to froward may be obsolete, froward apparently is still in use. It’s just not used very often. To me, this word seems hard to pronounce. If I don’t concentrate, I’ll say it as something like “frerd.” Must be something about the “W” being stuck between “R” and “R” that brings out my inner Elmer Fudd. I wonder if froward fell out of use because it was just hard to say and easy to confuse in its written form with forward? Don't forget "untoward", which is the exact opposite of the various obsolete meanings of "toward": something untoward is improper, inconvenient, awkward, or rude.